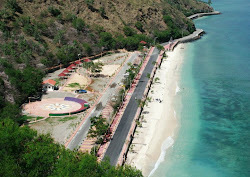 The Sunset Fair takes place on one of the very best beaches in Timor-Leste: Kristu Rei. With its pure, white sand and sparkling turquoise water, it's hard to believe that this beach is so close to the city centre. Joggers often come here to run up the steps to the famous Kristu Rei (Christ the King) statue of Jesus, which looks down from the hilltop that dominates the landscape. At dusk, there is often a cluster of sports fishermen casting their lines from the rocks at the bottom of the hill - if they're lucky, they'll hook a tuna. If not, they can always get a delicious fish dinner at Ugo Lebre's popular "Billfish" restaurant, which serves up locally-caught seafood with style. The Sunset Fair location is its greatest asset: why not take advantage of the scenery, come down early, bring a couple of deck chairs and have a meal on the beach whilst the children play? This week, some of the Arte Moris drummers came down to add a bit of rhythm to the proceedings. Their traditional Timorese drum beats drew customers to the stall, which sells original artworks, cards and very cool t-shirts printed with original Arte Moris designs. 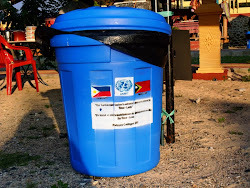 They also set up a collection box for donations to go towards the cost of running this free art school, which has become a much-loved institution in Dili and a tourism attraction in its own right. At this week's Sunset Fair everyone seemed to be munching: popcorn, satay, ice cream, rissoles, burgers, katupa rice packets.... there's a snack or a meal to suit all tastes, with smoothies, fresh juices, icy cold beer, sangria and wine to wash it all down. With dinner out of the way, it was time to settle down to a movie: this week the much-anticipated film "Balibo", which has been a real blockbuster at Cinema Lorosa'e's free movie screenings around the country. Someone should open up a Sunset Fair stall selling buckets and spades! THIS is why it's called the Sunset Fair! Decisions, decisions... what to eat next? should we bring in frequent flyer points? The Cinema Lorosa'e projectionist screens "Balibo"
Thanks to Hiro Motor Cycle for sponsoring this week's Bouncy Castle! TGI a VERY long weekend!